Spout expandable up to 30"
Update your kitchen by adding this stylish yet durable Vigo faucet. Chrome finish with matching deck plates all solid brass construction for durability and longer life. Faucet features dual pull-out spray head for aerated flow or powerful spray. Includes a spray face that resists mineral buildup and is easy-to-clean. 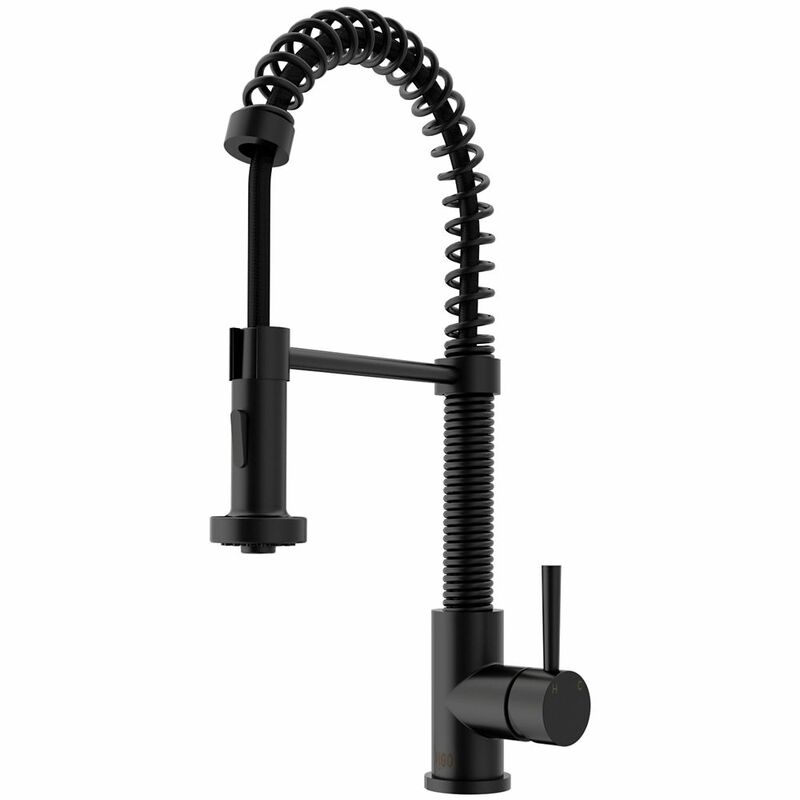 Pull-Down Spray Kitchen Faucet in Matte Black is rated 4.6 out of 5 by 1202. Rated 3 out of 5 by Skim from Looks nice but unsure of quality Every time we turn the faucet on a bunch of air comes out first making a weird noise. You’d think it was an installation problem but our contractor friend has installed many faucets for us before and we’ve never had this issue. He spent a lot of time trying to tweak this one to make it better but the noise is still there. Rated 5 out of 5 by JeffB from Love this kitchen faucet! Just did a total remodel of our kitchen. After looking at the same aging kitchen since '96, we went all in and did a total remodel. We wanted everything to be perfect and tie everything together. So when it came time to buy a faucet, we wanted a faucet that looked great, and functioned well and was built solid, but that didn't cost $1000 or so. After weeks of looking, we decided that the VIGO Edison was the way to go. After having it for about a month or so, I literally just told my wife how much I love that faucet and loved how well it went with the new kitchen. Great looks, built tough, and super simple to install! Yes, the sprayer head is removable but we do not recommend this to be utilized with a garden hose.